The Diamond DA62 is one of the newest light general aviation twins on the market, with the type only having its first flight back in April of 2012, with EASA and FAA Certification not arriving until 2015 and 2016, respectively. 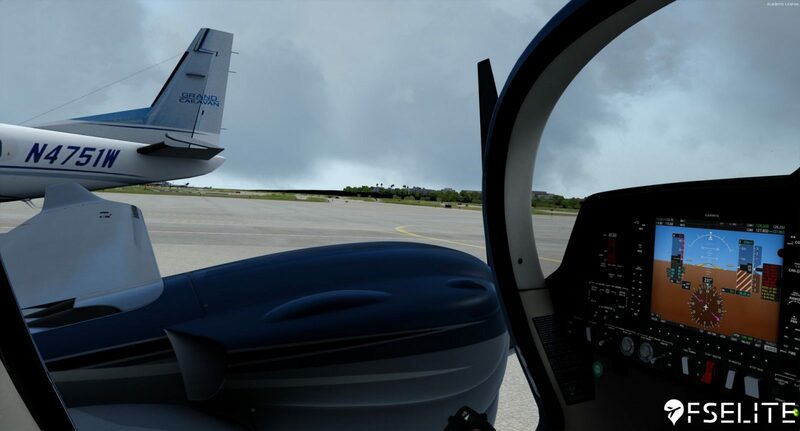 It’s sleek, modern, and efficient, fitted with twin, FADEC controlled, Austro AE300 engines and an all-glass G1000 suite being fitted to make the entire experience easy for the customer to fly. 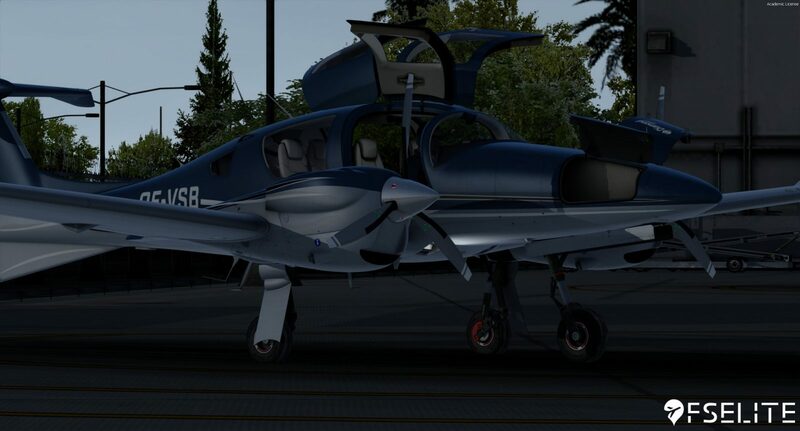 The Vertx DA-62 aims to deliver a simulation of this uber-modern aircraft like no other. 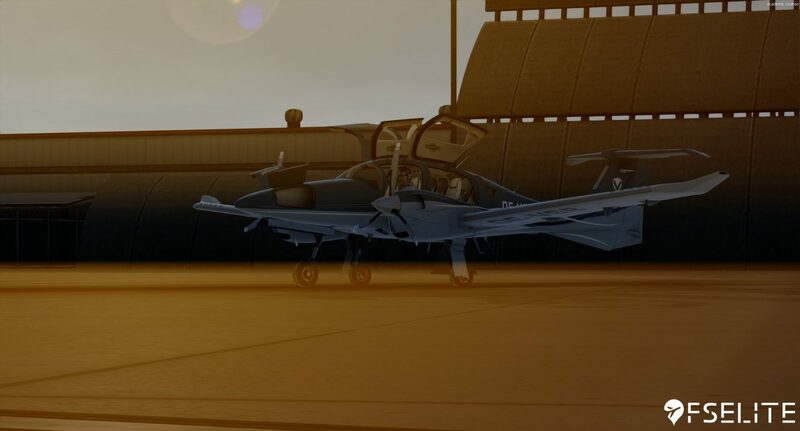 Developed by Sean Moloney, the aircraft has a lot to live up to considering the powerhouse of a developer it has behind it (the entire plane was developed by Sean himself from what I’m able to gather). So the real question is: does it? Let’s talk about that. 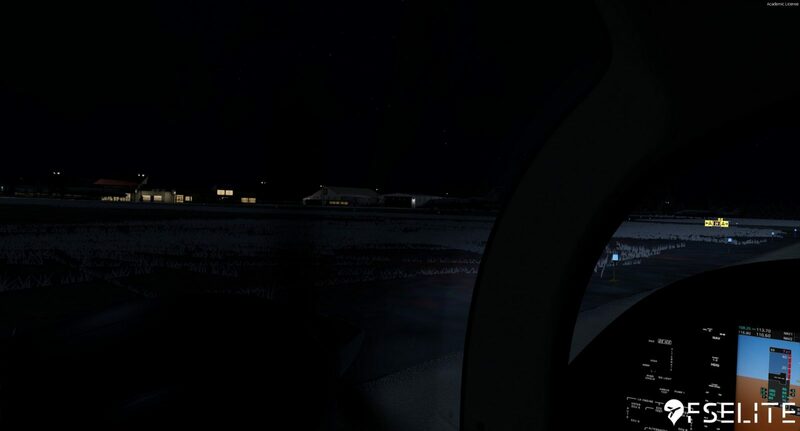 Upon first loading into the aircraft in a cold and dark state, you realize just how modern the aircraft is. Gone are the mixture and condition levers you’re used to in a conventional twin, and in their place are 2 thrust levers, one for each engine. 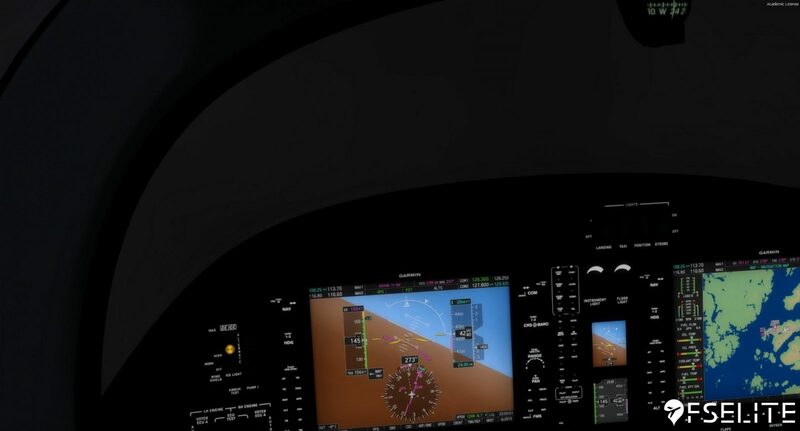 Panning around the aircraft, your focus is immediately brought to the 2 G1000 displays sitting front and center in the cockpit. 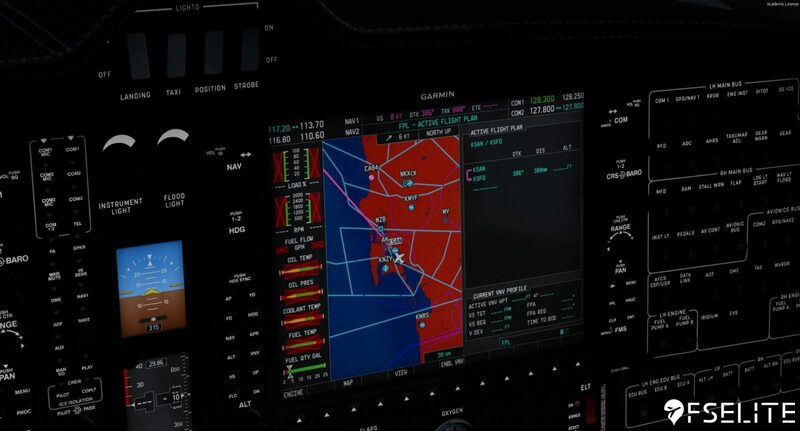 The displays themselves look stunning and carry Garmin’s hallmark glare reduction finish that makes the displays readable even in the harsh glare conditions of direct sunlight. 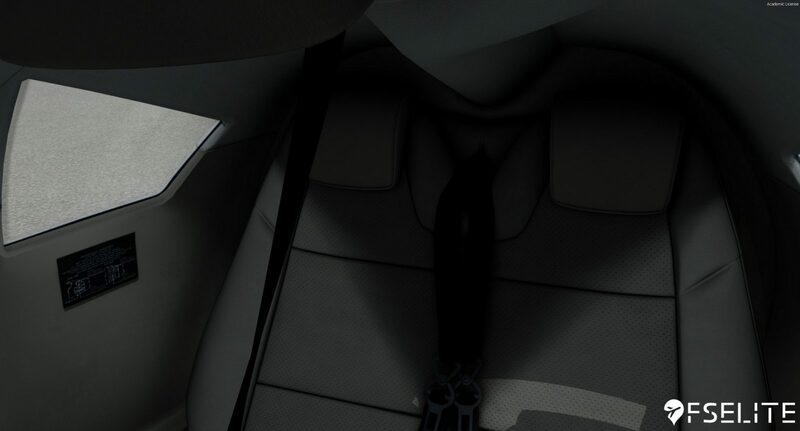 Swinging your attention to the rear of the cockpit, you notice that no detail has been spared on even the rearmost seats, with the leather textures just as crisp all the way in the back as they are on the frontmost seats. 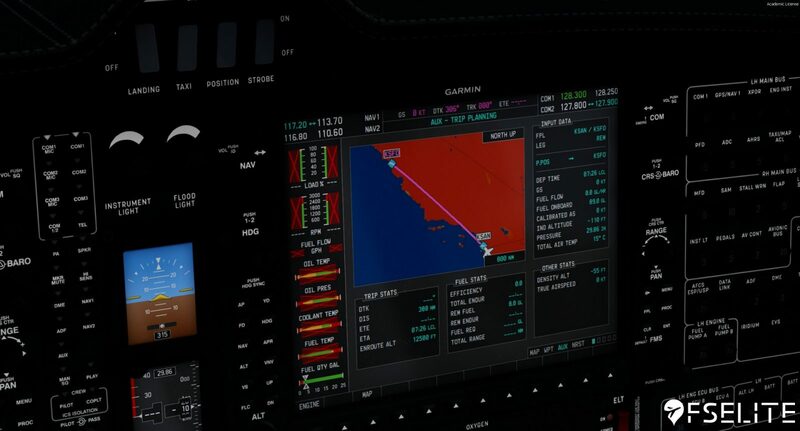 An interesting feature Vertx added to the G1000 is a system where the knob you’re about to toggle is illuminated (in this case almost Garmin blue). This is a nice inclusion given Garmin’s borderline obsession with their hallmark ‘wedding cake’ controls. Knowing which knob you’re about turn while you’re getting bumped around in turbulence more useful than it sounds, just take my word for it. The modeling is no slouch, either, with it being just as high quality as the texture work. Nothing looked blocky when it was supposed to be round, as common in other aircraft, which I was pleased to see. The cockpit, overall, is one of the best looking I’ve seen in a while, and right up there with other high quality, general aviation aircraft. One thing I noticed in the cockpit in my experience with the plane is how the autopilot disconnect button on the control stick isn’t clickable. 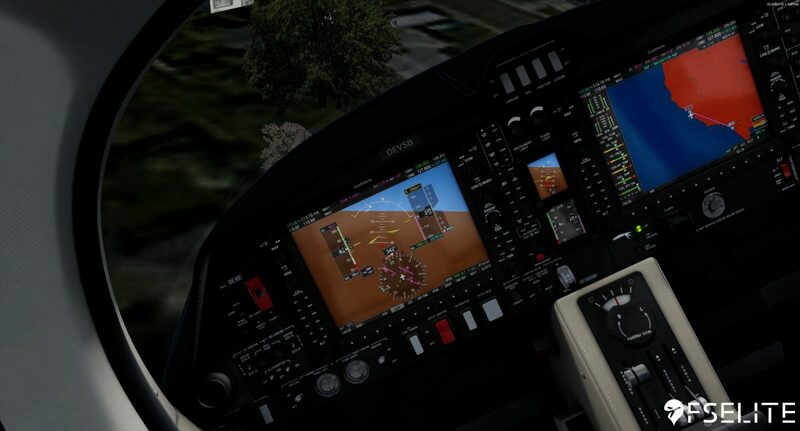 In order to disconnect the autopilot, you’ll have to manage to hit the small AP button on the G1000 itself. It’s not the biggest issue in the world, but it would’ve been nice to see it made clickable nonetheless. Moving to the exterior, the standard here is the same as the cockpit (for the most part). I can’t find a single area to fault Vertx’s modeling here; it’s top notch. Walking around the aircraft, your eyes are treated to an extremely high-resolution 3D model, with everything from static wicks to GPS antennas modeled. A click of the mouse over the baggage doors in the nose opens them up gullwing style and adds to the atmosphere of an aircraft sitting on the ramp and prepping for a flight. One area I would’ve liked to see improved is the resolution of the exterior textures. Looking at the wing from the cockpit, the textures on the inside nacelles of the engines just look weird. Not quite blurry, but far from crisp and clear as I would’ve liked to see them. Talking about the exterior of the aircraft, another gripe I had in this department was the lack of a paintkit. The Vertx DA-62 comes with liveries by default, with 5 being real world and one being the Vertx house livery, as simplistic as it is. Being an aircraft operated all over the world, mainly in Europe, it was disappointing to only see 3 European registrations and an even scarcer 2 American tail numbers. At the very least, the ability to edit registrations on the existing liveries would’ve been nice to see, though a full-blown paintkit would’ve been ideal. 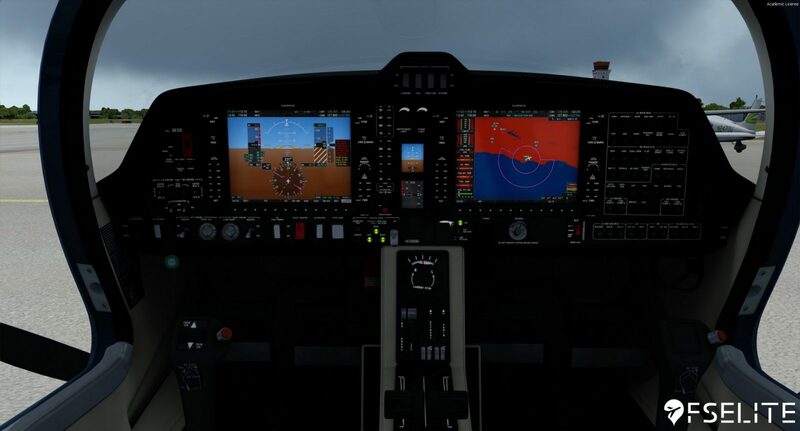 With the visuals largely out of the way, let’s get onto what the Vertx DA-62 was highly anticipated for: the in-depth G1000 and engine modeling. 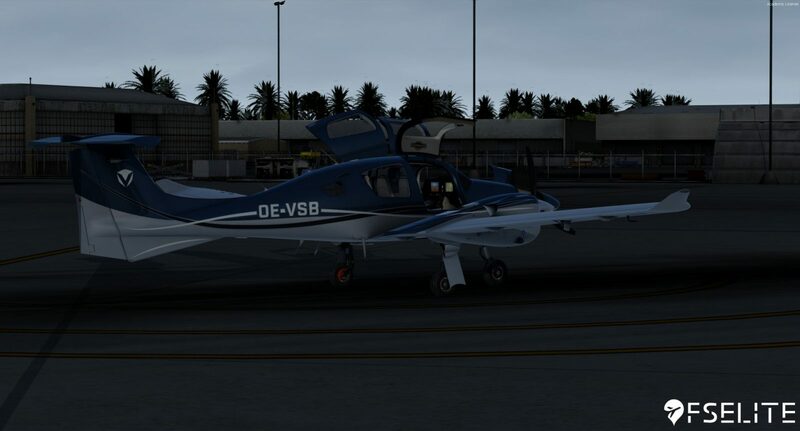 In my time with the aircraft, I decided to embark on a delivery flight of the DA-62, aiming to fly from the Diamond home city of Vienna all the way to Santa Barbara, California. While I won’t give a full rundown of my flight step-by-step (as that would be extraordinarily boring to both read and write), let me give you an overview of what I did. The first leg took us from Vienna, Austria all the way up to the top of England in Stornoway. From there, I made the lengthy transatlantic crossing over to Nuuk, Greenland and after a night of rest, I forged ahead to Bar Harbor at the top of Maine (a special thanks to Orbx for providing Bar Harbor free of charge to aid in my review). From Bar Harbor, it was simply a matter of hopping across the U.S., a thousand miles at a time. 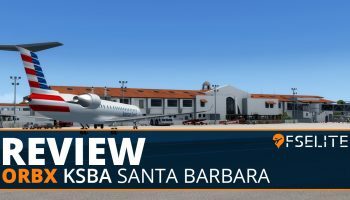 First MBS, then to MSP, Denver, and finally onto Santa Barbara. Let’s start our analysis with the most logical point: startup. 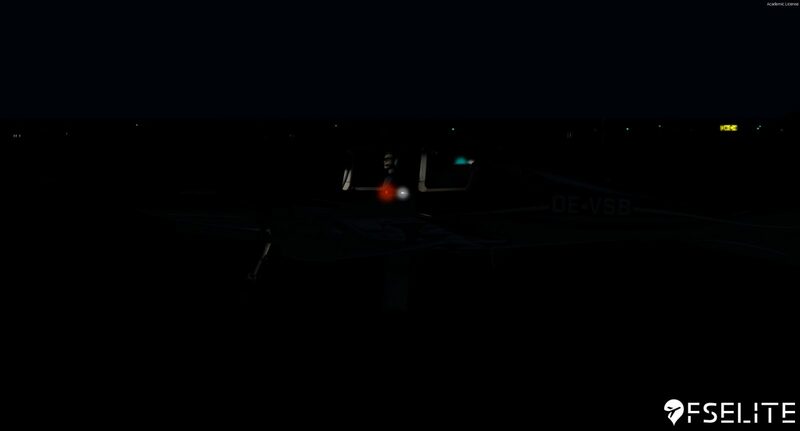 Loading into the aircraft cold and dark sees the aircraft completely shut down, and the G1000s laying dormant. 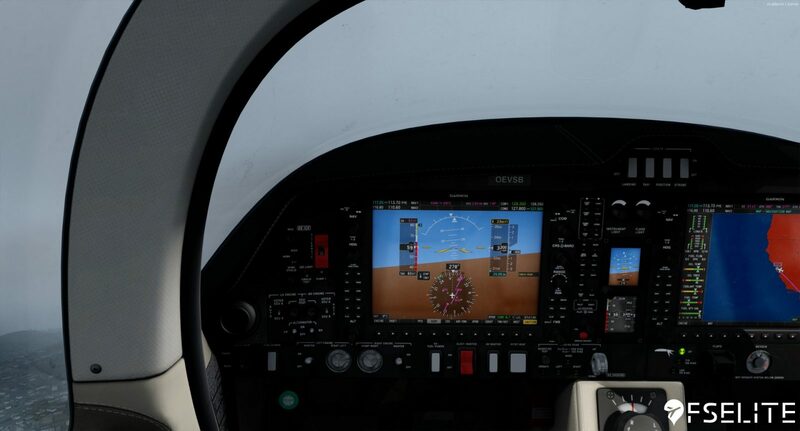 A flip of the battery and avionics master switches sends the G1000 into its startup routine, and soon you’ll see the system getting its bearings of where it is and what it’s doing. Once the system has finished its initialization, you’re left staring at the PFD and the navigation display, ready to go. 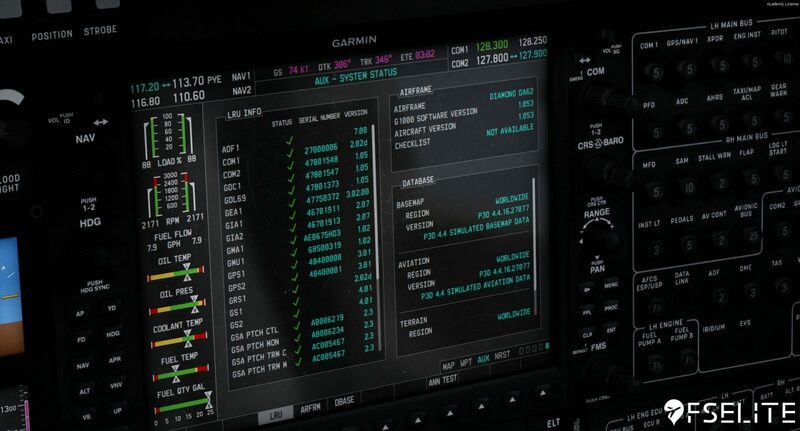 As many real-world G1000 warriors will know, route input without the optional keyboard is a truly infuriating affair with Garmin’s obsession with their scroll knobs in this system. Having to input a string of waypoints numbering in the double digits occasionally for cross country flights is enough to drive a person to the brink of insanity. Happily enough, Vertx thought of this and made it so that the G1000 will automatically pick up and load a flight plan that’s been put into the default flight planner, and this is a feature I see most people using once they get fed up with the manual way of doing things. 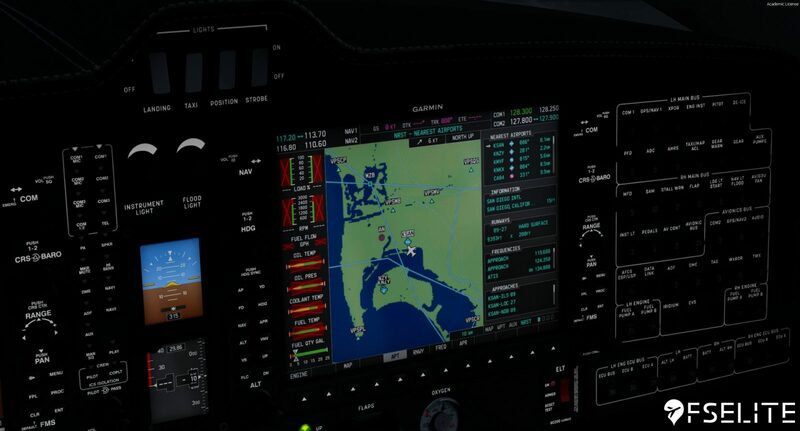 Digging deeper into the G1000, you’ll notice how pretty much every page in the system is there and simulated, even down to the AUX-GPS position which displays the constellation of GPS satellites its pulling data from, and the signal strength for each individual satellite. The fuel planning AUX page is a life-saver on those flights where you’re pushing endurance to the maximum, as you can clearly see the relationship between power setting, ground speed, and range. Animations in the system felt smooth and fluid, lacking that almost micro stutter some other glass implementations have. 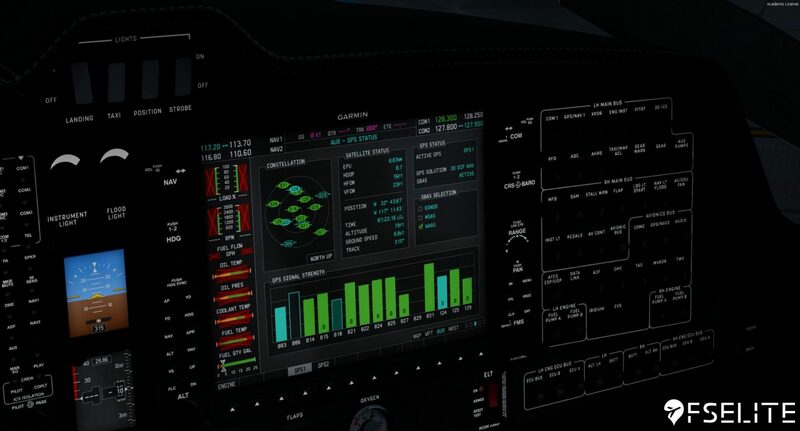 Something worth noting is that the G1000 isn’t able to be popped out as other developers have done with their displays. This was done, apparently, because making the display look how it’s supposed to in the size of a 2D popout wasn’t possible/feasible. There are custom views included that are zoomed in on the displays, though the simplicity of just clicking the display to make it bigger can’t be understated. 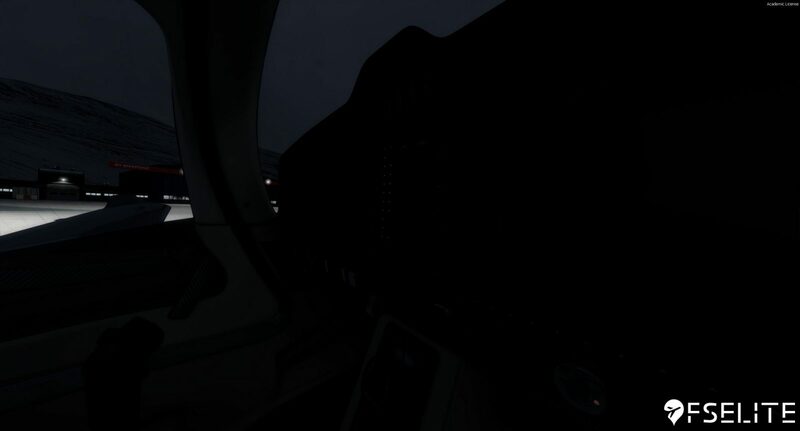 Speaking of views, an odd quirk I observed was that all the views besides the main pilot’s view were locked and unable to be moved via the default camera system. While most simmers these days are most likely using either Chaseplane or EZDock, I feel like this should’ve been one of those things that’s just..there. I’m not sure why they were locked in the first place but needing a 3rd party camera system just to be able to turn your viewpoint in the right seat seems a bit odd. Another area I wanted to touch on is the windshield effects department, and specifically how it’s nonexistent. For a plane built exclusively for Prepar3D v4, the absence of rain effects on the windshield was disappointing to see. 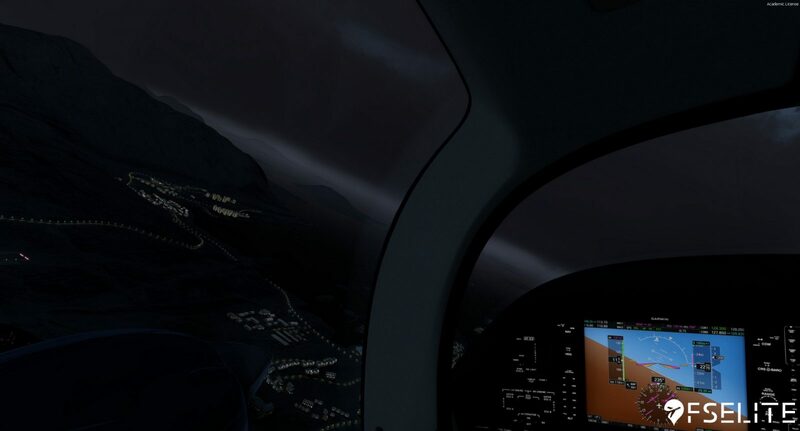 Oddly enough, raindrops were visible in the ‘cockpit’ view, but not in the actual, 3D virtual cockpit. This may just be an implementation bug that slipped past the testers, though considering the plane has had few to no updates since release, I don’t foresee it being fixed in a timely manner. While rain may be broken in the build I reviewed, the effects in general in the Vertx DA-62 are rather nice as a whole. 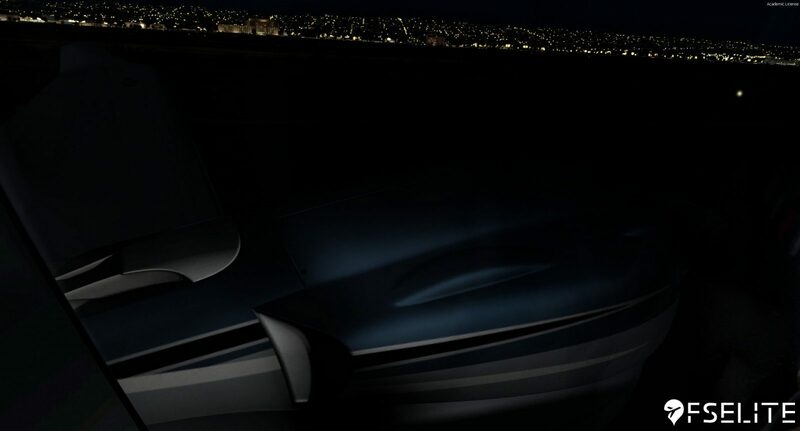 The harsh, blue-ish beam from the LED landing lights is a sight to behold on its own and was really cool to see. 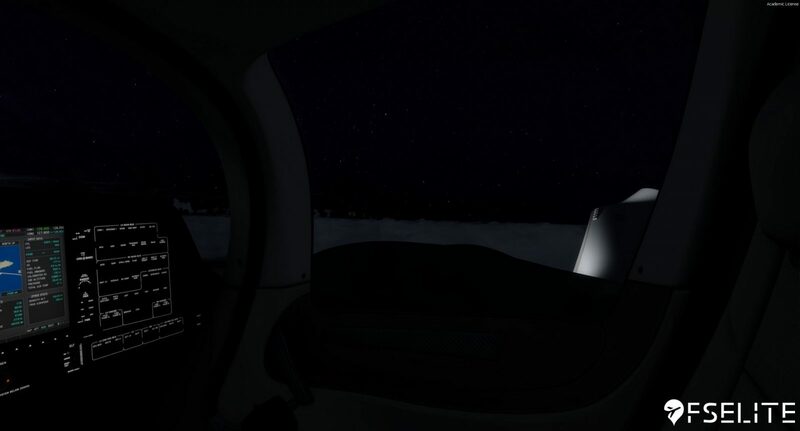 At night, and with the cockpit dome lights switched on, you’re able to see the light from the cockpit spilling out of the huge windows and softly illuminating the inside of the engine nacelles and the inner portion of the wing. While these are truly well done, the strobe effects are less so. Don’t get me wrong, they’re not bad, far from it, but they don’t reflect back off the ground, or really illuminate anything else around the scenery. 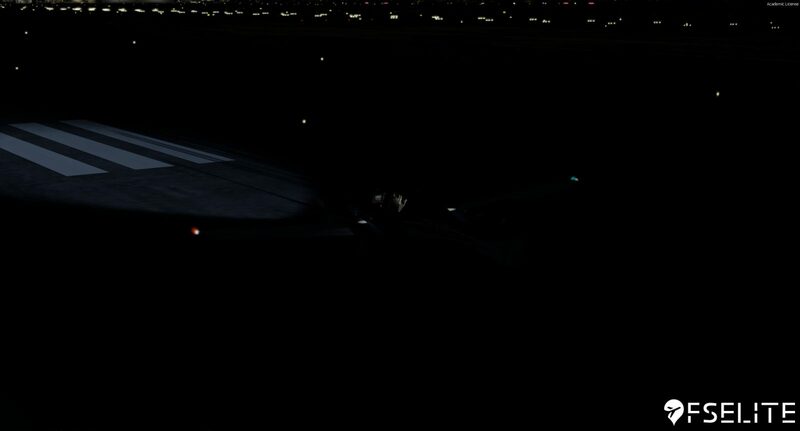 This probably comes down to the effects system not utilizing the dynamic lighting system of v4, but again in a plane build exclusively for v4, this is odd to see. Taxi dynamics are a department I wanted to devote an entire section to for a simple reason: they’re abominable. Plain and simple. 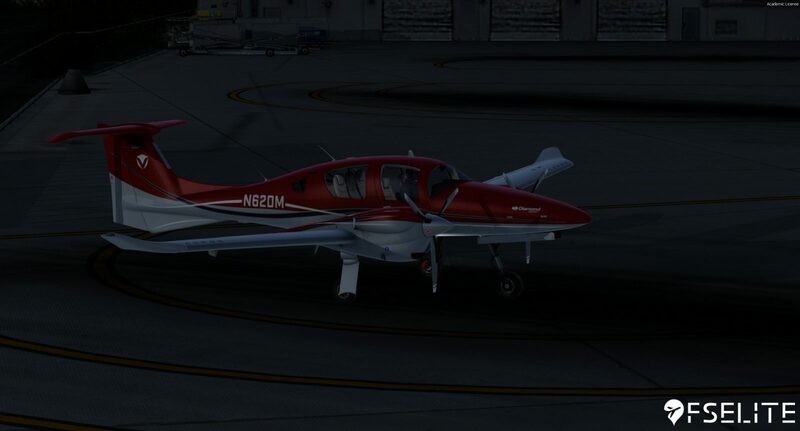 The Vertx DA62 appears to use the default Prepar3D ground friction system to govern its taxi dynamics, and this makes for an infuriating experience just attempting to taxi out to the runway or back to the FBO. Breakaway power at full fuel in my experience was around 40-50 (which I had to sustain for a few seconds) then the aircraft would rocket away unless I yanked the power back to idle, at which point it’d slowly decelerate until it was stopped again. 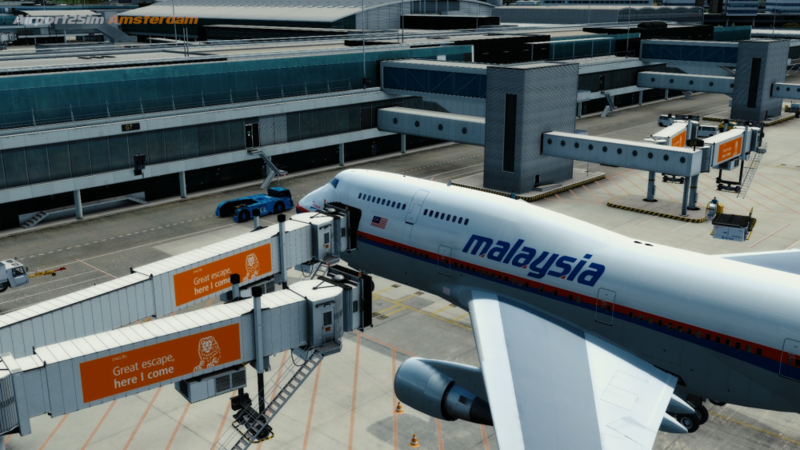 Honestly, the taxi dynamics made me dread having to make a long trek across the airport back to the GA ramp, and I sometimes elected just to taxi across the grass to save me the trouble. It’s that bad. Speaking of infuriating affairs, setting your fuel and payload is no fun task. 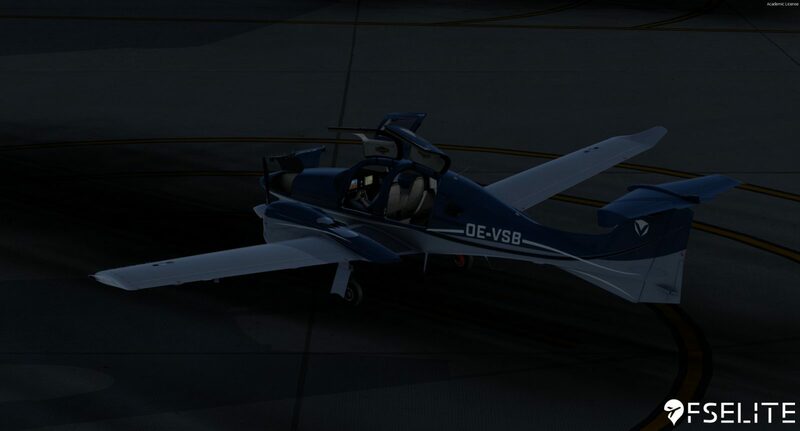 The DA-62 relies on the built-in fuel and payload menu to set everything up, and this makes trying to dial in a specific fuel load, and have it balanced, close to impossible. I found it was just easier to set all the tanks at full fuel, rather than have to fiddle with it for an eternity. I can’t help but feel this would’ve been a nice inclusion in the configuration app that ships with the plane. The flight model that ships with the aircraft is really, really well done. That’s all I really have to say about it. It just feels like you’re flying an actual plane, which is no simple feat in a simulation. Stalls send a wing dropping, and application of full power on the takeoff roll will pull the aircraft to the left. Spins are a thing to watch out for when practicing stalls as well, as the aircraft seems to love to drop one of its wings when stalling. 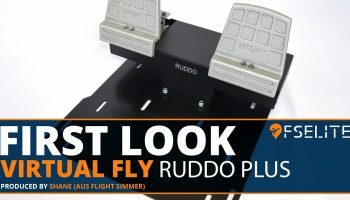 Flying on a single engine is a great experience as well, with a strong rudder and aileron deflection needed to keep the aircraft in controlled flight. 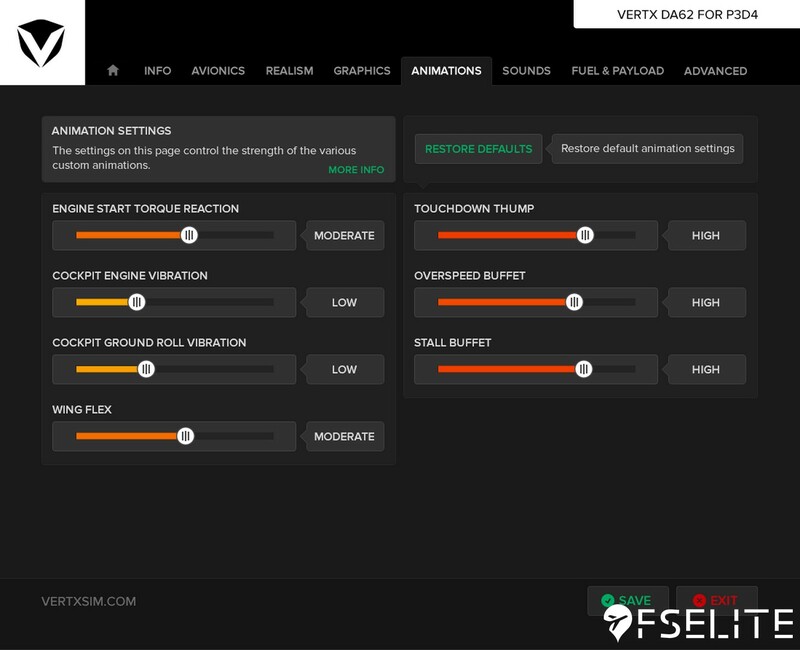 In addition, if any of these effects seem too daunting for you, you’re able to set them to an easier, though less realistic setting in the included configuration app. The configuration app is one area of the plane that I didn’t have any issues with. It just works. 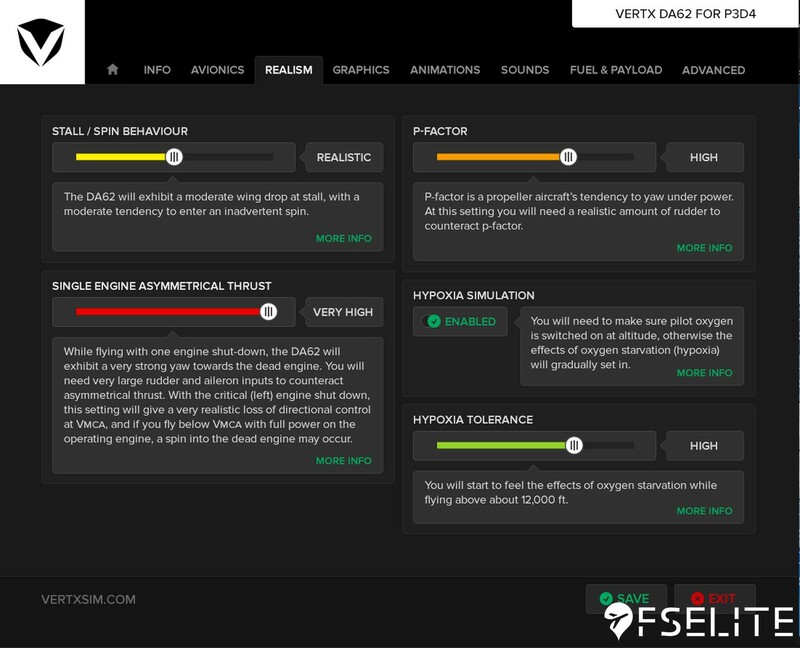 In the app, you’re able to configure just about everything in the plane, ranging from tuning flight dynamics to be more, or less, realistic, to refilling your oxygen and deicing fluid, and even adjusting the cockpit vibration system to tune it to your individual preference. 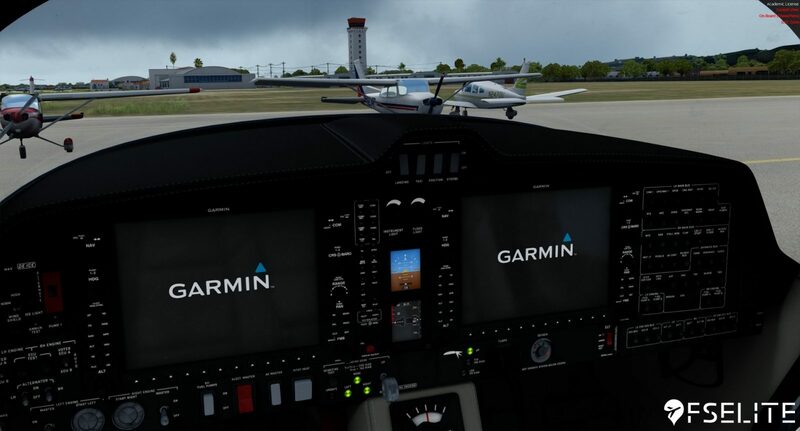 Options are also available to check which version you have installed, various engine stats such as individual engine hours and the odometer, as well as a place to grab the DA-62 flight and G1000 manual. Now, back to the gripes. 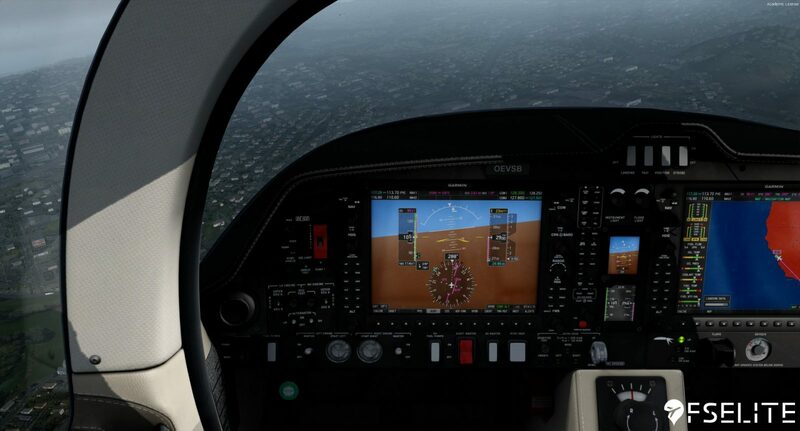 With what I’ve previously said in this review, you’d think that the G1000 is a flawless piece of tech. While it’s quite remarkable in some areas, others left me wanting more. For instance, the aircraft uses the default Prepar3D navaid database, meaning the plane is using 2006 data to boot. This also means no out of the box SID/STAR support, which is disappointing to see in an aircraft so heavily marketed towards commercial and ATPL training schools. The database isn’t updateable via Navigraph, either, instead requiring an FSAeroData subscription in order to bring it up to date. Honestly, with the number of developers now supporting Navigraph data integration in one form or another, not seeing it here leaves me wondering why it was left out in the first place. 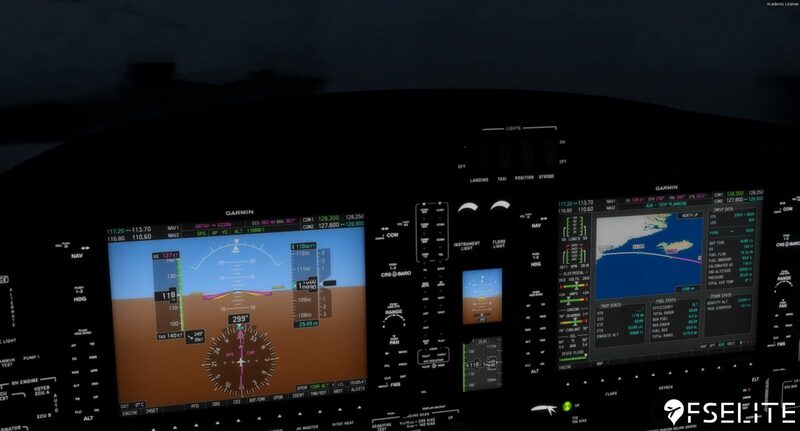 Continuing with my gripes of the G1000, there’s no weather radar in the plane. 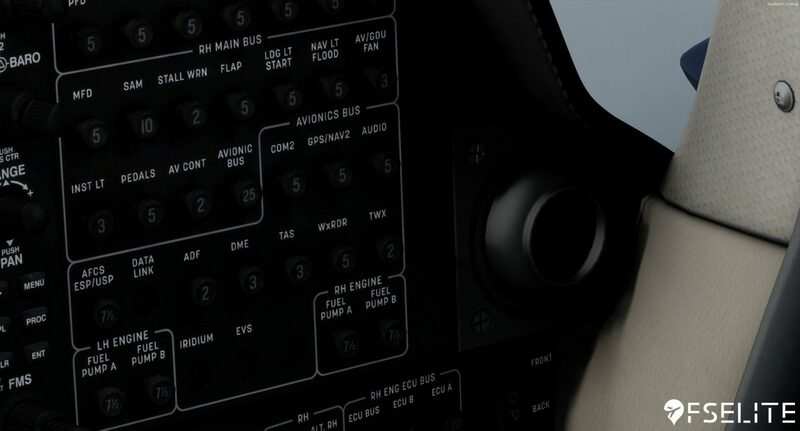 While I understand the weather radar system is optional in the real world, the cockpit model does, in fact, have a circuit breaker for a weather radar, inclining me to believe their reference aircraft did as well. 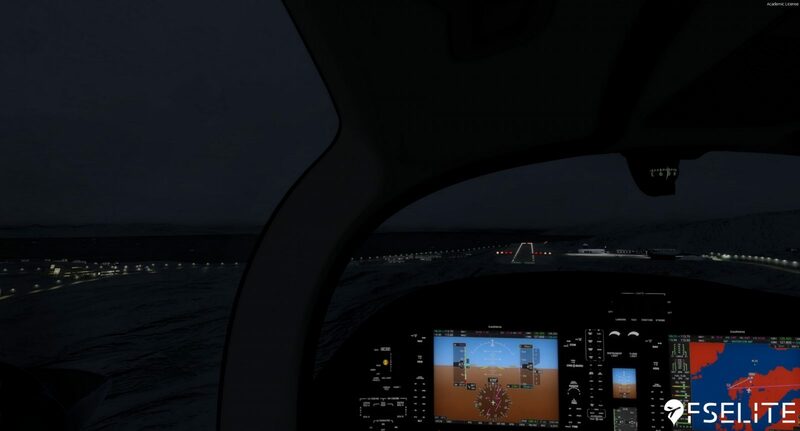 Even just an ActiveSky overlay on a G1000 page would’ve been great to see. That’s better than what we have currently, which is nothing. The sounds in the aircraft are simply stellar. The engine start is indicative that you’re not flying an ordinary piston twin (the Austro engines are diesel and burn Jet-A) and the sounds you hear as you’re running up the engines are superb. The aircraft also seems to use some sort of spatial audio system, as the sound direction changes as you move your viewpoint around. When you start the left engine, you’ll only have the engine sound in your left ear, and vice versa. Wind sounds as you bank into changing directions and speeds are quite nice as well, and really give you that feeling that there’s wind affecting your aircraft. Best of all, none of the sounds sounded repeating in the slightest. Overall, this department is probably the best of the plane. Really the final area I want to touch upon before I talk about performance and value is updates, and more specifically the lack of them. The aircraft released in early December yet has had maybe 3-4 minor patches since then. A major update is (supposedly) coming soon, but that was back in late January and we haven’t heard anything else since. It’s also worth noting that correspondence with Sean was started when I first began the review process, but communication dropped off after my second email, with many questions left unanswered. 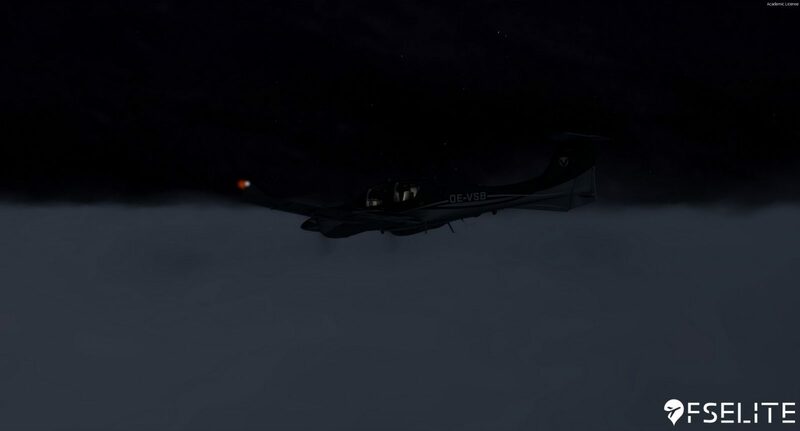 I found the performance of the DA-62 to be close to perfect, even in dense clouds and high settings. CPU usage is half of what I see with the heavy tubeliners, and everything remained silky smooth. The only time when frames started to tank was at night and flying above a solid overcast layer stretching to the horizon, but that’s to be expected in really any aircraft these days. Available for a cool price of $39.95 USD, the Vertx DA-62 is a great value however you slice it. 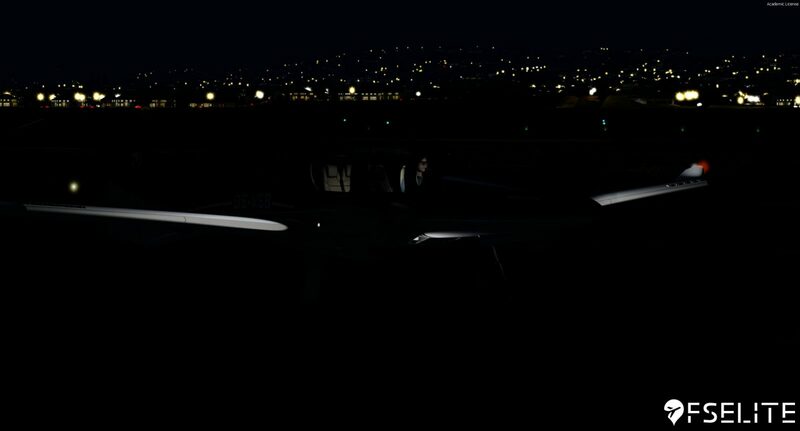 It’s priced competitively in the GA market, and below some of the other high-quality general aviation offerings on the market but for a reason: there’s nothing really, truly, groundbreaking here, apart from the G1000, and there’s also not much in the way of failures or maintenance, both of which other developers in the market have included for years. 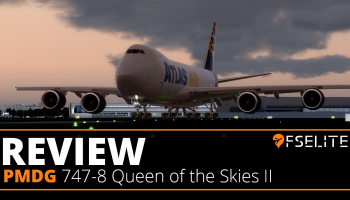 One additional consideration to keep in mind is that updates to the plane have been extremely sparse since its December release, but a new update is supposedly coming soon according to Sean back in late January. Even with this being said, the DA-62 is still a bargain for what you get, even with its shortcomings. The Vertx DA-62 is a high-quality rendition of one of the most modern and recent general aviation twins available on the market. 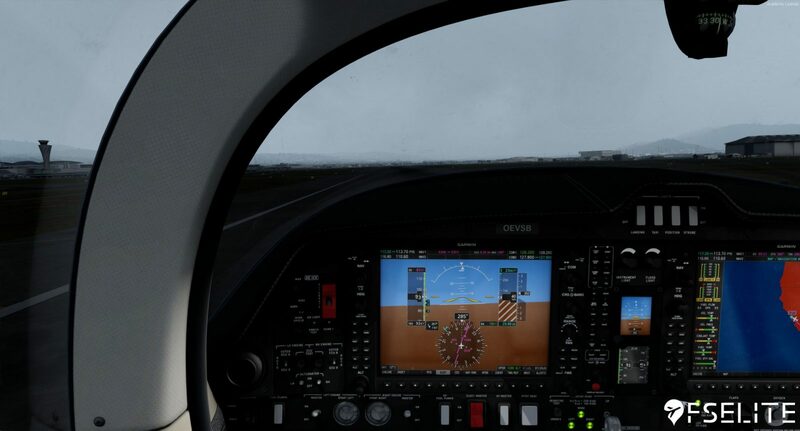 While the G1000 is certainly next level and sets a new bar for simulations of the system, other areas of the aircraft left me with a bad taste in my mouth and detracted from an otherwise great experience. 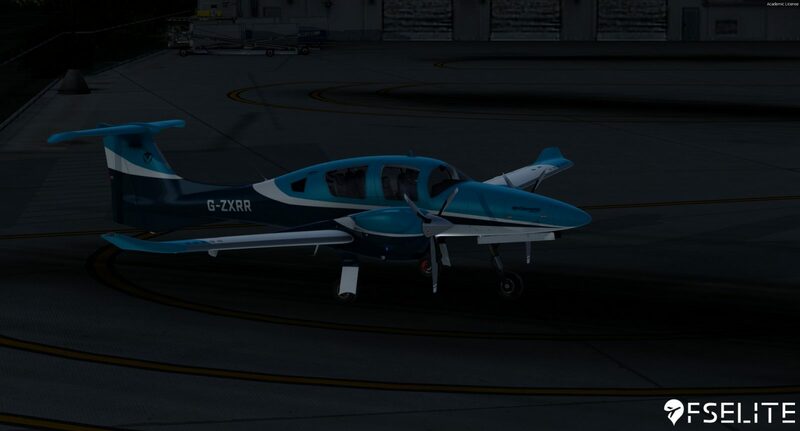 The Vertx DA62 is a nice plane, even bordering on great in some aspects, but there's just so much left to be desired for me to call it something as groundbreaking as many were expecting. Would I recommend it for the price? Absolutely. 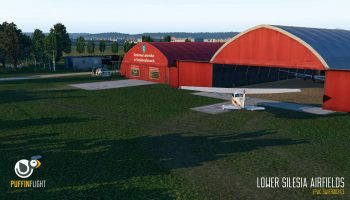 Is it the best aircraft in my hangar? Certainly not. 7.6 Out of 10 How do we score? | Feedback? 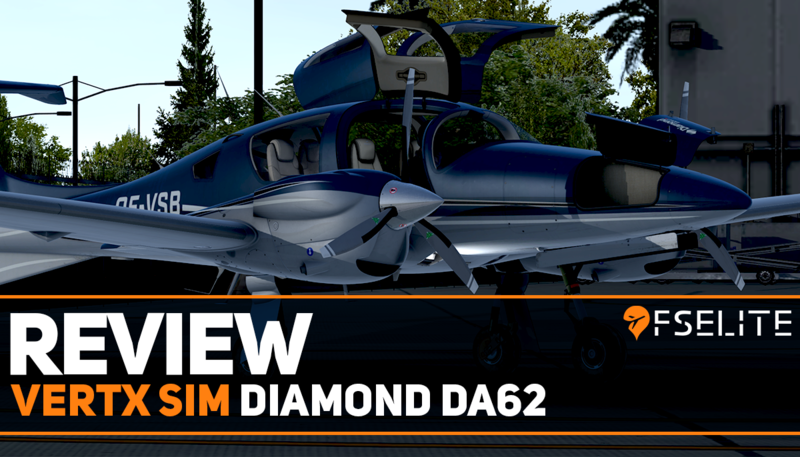 It has been a while since we last had a product from Airline2Sim. In fact, I have been eagerly awaiting the 777 Cadet Plus Training Program, but those types of courses take an unbelievably long time to produce and create. 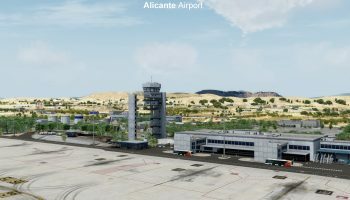 In the stop-gap, Airline2Sim decided to instead release a new line of products: Airport2Sim. 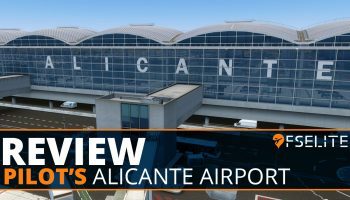 The idea behind it was to apply the same level of detail and production quality on giving people an opportunity to learn about specific airports. The first airport in a long-line to come in the future is one of Europe’s busiest hubs: Amsterdam Airport Schiphol (EHAM). With over 70 million passengers passing through the interconnected terminals each year, there’s always going to be a huge amount of traffic moving around the airport. Furthermore, the large number of runways, taxiways and noise abatement procedures mean that there’s always something to be mindful of. 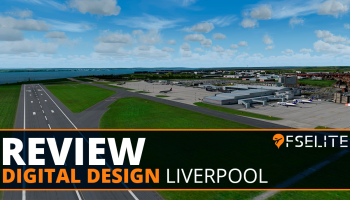 The number of procedures and scale of the airport often puts many people off from enjoying and understanding that a lot of the airport design is purely intended to make things as easy as possible. It’s also worth noting that Schiphol was designed as a “flower”, with the hub in the centre and then runways going in every different wind direction. Eventually, it was realised that this didn’t make for a cost effective and future proof design, so they decided to expand. As a result, multiple cities were removed just to be able to build the airport up. 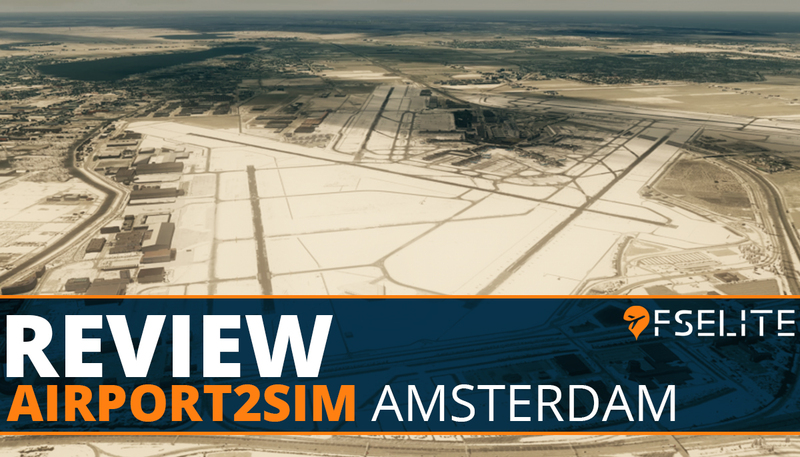 The beauty of the Airport2Sim video collection is to try and give simmers, and to another extent pilots, a reason to try out Amsterdam Airport Schiphol and actually not feel so overwhelmed by the crazy taxi times, numerous routings and more. 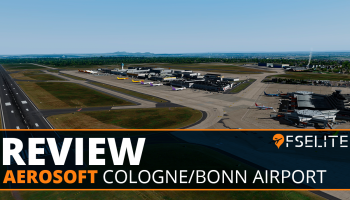 The package is split into two parts: a 6-part video series and also a file package which contains GSX airport profile configurations settings and also a handy chart of which airlines park at which gate and with which aircraft. I’ll come onto the files shortly, but first I want to focus on the main attraction: the training videos.